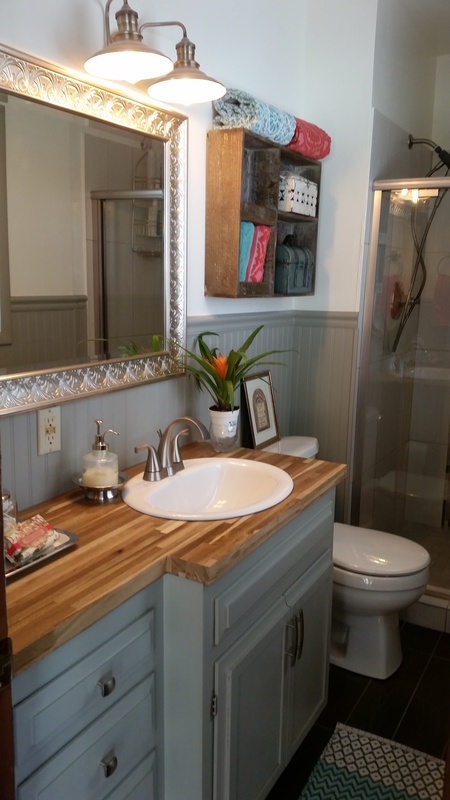 When I decided to remodel my downstairs bathroom I had all these dreams of changing the vanity, the walls, the floor and the shower stall. But life likes to throw curve balls and when I first started demo-ing the bathroom I found mold! Of course, my heart sank! There goes my budget. So I had to hire professionals to get rid of that and turns out they had to take down parts of the walls and that meant finding asbestos too!! This house is from 1965 and drywall had asbestos back then. Yet, another ding on my budget. After all was said and done my budget was pretty much gone and with that, my dreams of having a new vanity and a fancy granite top. This post contains affiliate links. I may make a commission from any purchases you make through these links without any extra cost to you. This is how I make sure my foster birds have enough food and toys until they find their forever home. I girl can dream, right?! I will soon have a post about my entire bathroom remodel. But what I really wanted to show you today was how I was able to save my original vanity (yes, from 1965!) and transform it into a modern looking piece just like the ones shown above. And all of that using less than a quart of paint, wood strips and wood putty (well, a couple of other things too but this was a cheap project considering the final look). 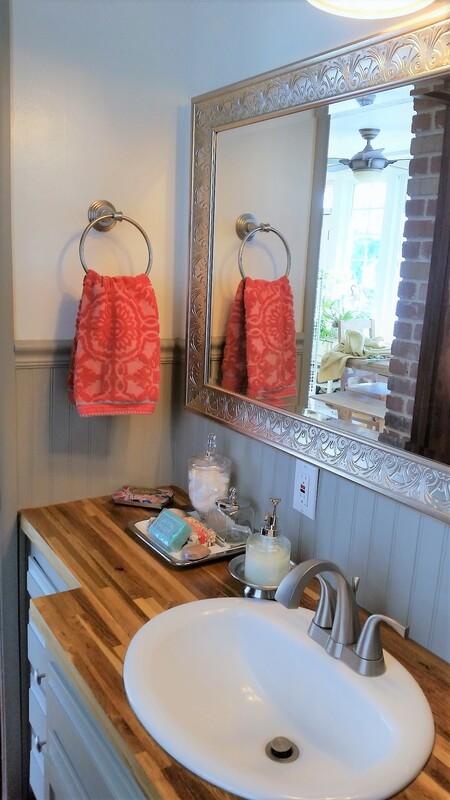 I did spend some serious money on a 8ftx.25in butcher block but I only used a 4ft x 22in piece for my bathroom counter and I was able to use another piece for my powder room remodel (see image below). After those two projects, I still have a lot leftover I can use for other projects like a DIY kitchen cutting board for a handmade gift or some cool shelving. So it was a good investment. 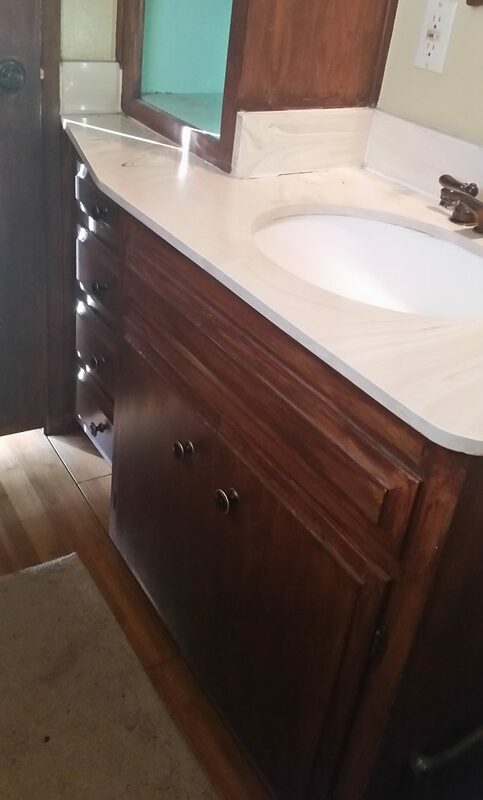 Since my dreams of getting a new cabinet were shattered by the unforeseen expenses I decided I was going to “save” the vanity that was already there. If I put anything deeper than 18 inches for the counter top near the door, my bathroom door wouldn’t close! Notice how the old counter top had this angled cut on the stone near the door? I could have put a smaller cabinet away from the wall near the door but then I would have a big gap between the wall and the cabinet. Also, any shelving or garbage can would have looked weird in that space since it would be on the other side of where the toilet was. 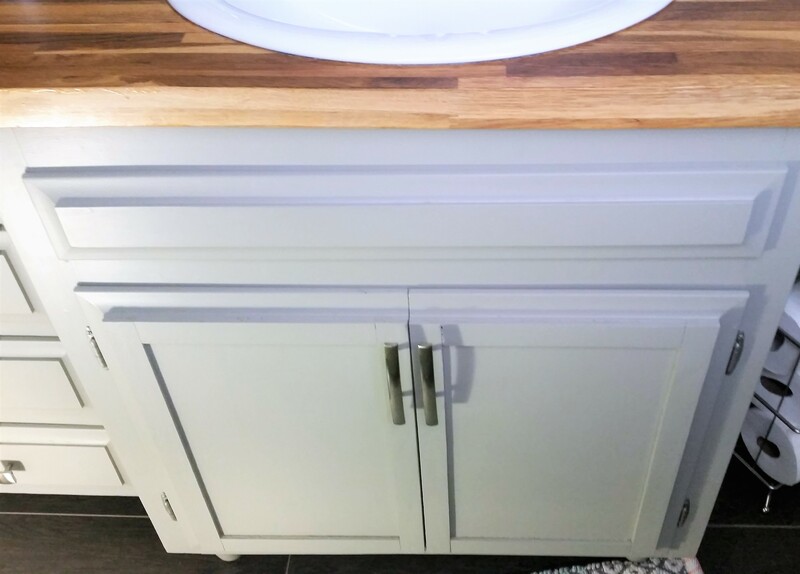 The old cabinet not only had drawers that were the perfect size for the area but the entire piece was perfectly lined up with the plumbing too. So I decided to keep it and make the best of it. Going back to demo day, I took the old vanity outside thinking it had mold on it too. But after a thorough inspection, there was only one small spot in the base. Since the base was warped anyway I cut it off and I decided that it would look more modern with wooden legs. The first thing I did after chopping the old base was to give it a good clean and apply wood filler to cover any dings and scratches. Once the wood filler was dry I sanded it to remove any imperfections. Then I gave it 3 coats of paint. I chose this light gray color called Morning Mist by Behr in semi-gloss. The semi-gloss would make it more impermeable and easier to clean in a bathroom setting. Looks like a million bucks already! I bought one quart of the paint and I didn’t even use half of it and that included painting the doors! 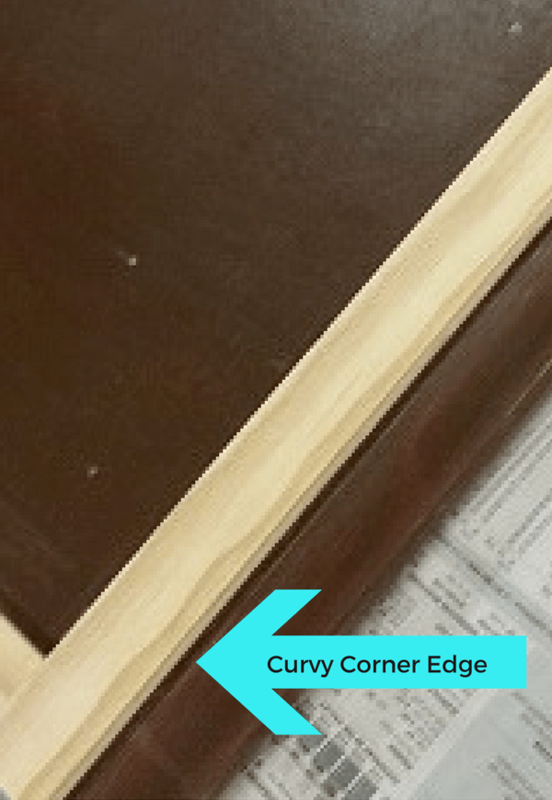 After a lot of searching for the right trim and how to make it work with the current curve in the corners, I decided that a “Shaker style” trim would not only be easier to apply but it would look modern and “farmhouse-y” at the same time. It was sooo easy I wish I had done this a long time ago! 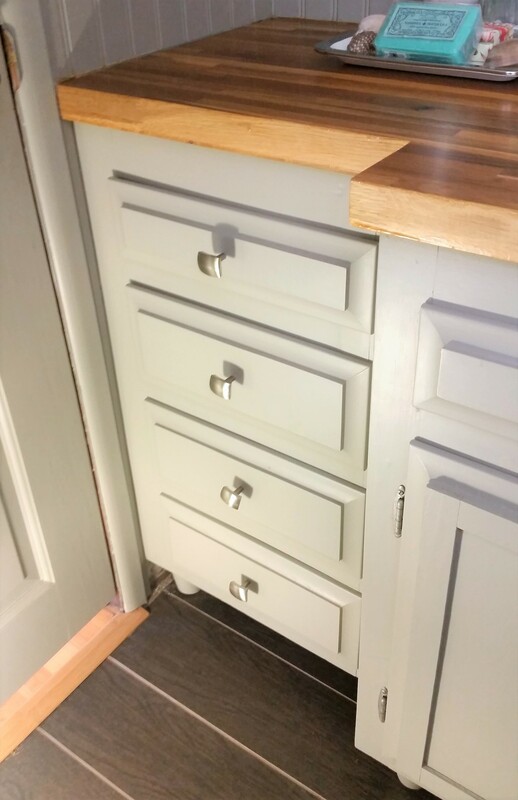 To turn the cabinet doors into a Shaker style, I needed a flat trim with no curves or anything. I went to the hardware store and found this 1in x 1/4 in x 4ft wood strip that would be perfect for my “Shaker” trim. For the two doors, I calculated that I needed four “4 footers” of this trim. 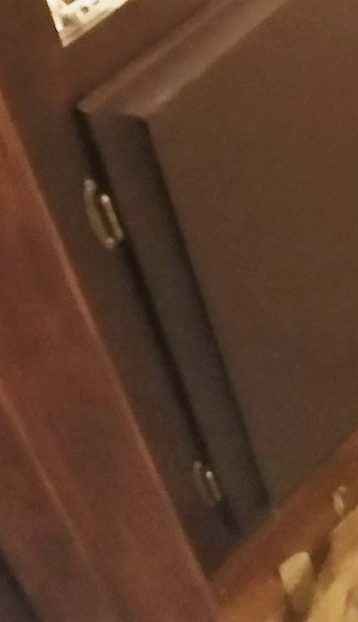 Basically, all I did was measure the edges of the door where the curvy detail ended and cut two strips for the vertical trim. 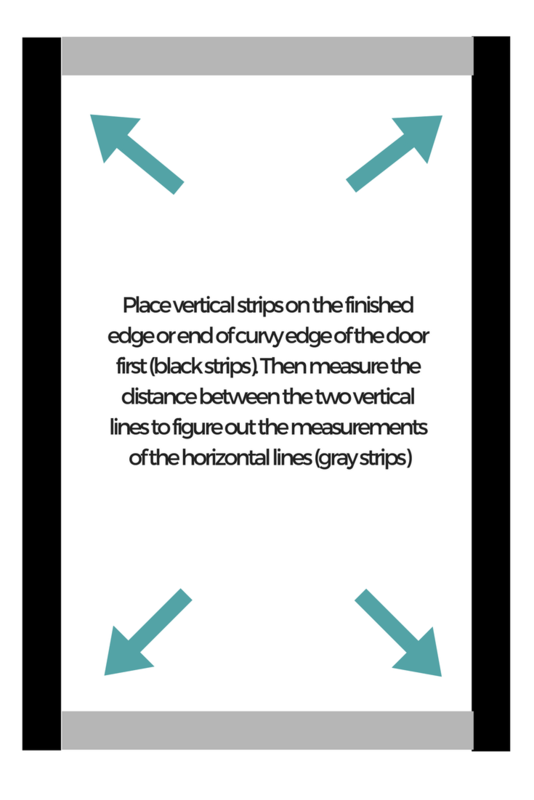 Then I measured the distance between the two vertical strips to cut my horizontal trim that would sit in between the vertical trims. I used Liquid Nails to glue the trim on the door and I let it sit overnight with the door faced down. I made sure to put a few books (weights) on top of it to make sure there would not be any unglued spots. Notice I plugged the hole for the old door knob with wood putty because the new door handle would be installed on the trim. 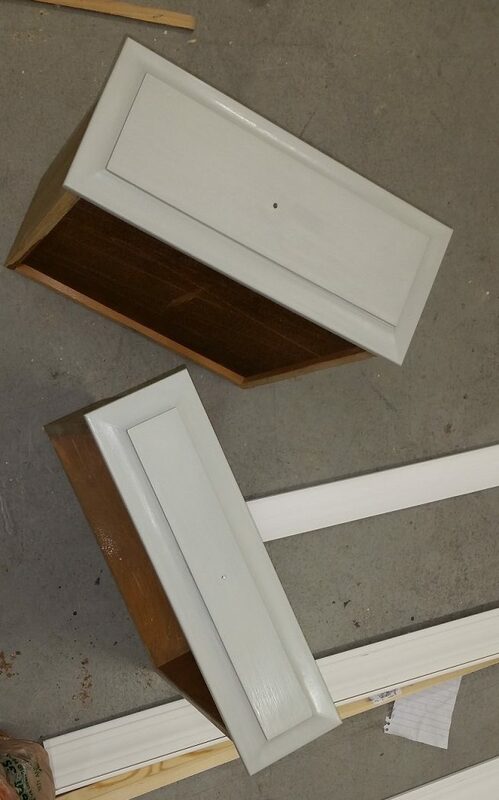 I did the same for both doors and painted them. Don’t they look modern already?! 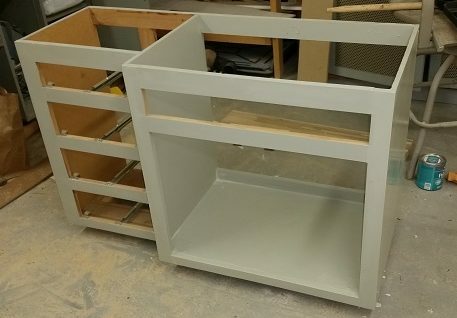 Then it was time to paint the drawers and install the feet (I painted the feet before installing them. Much easier that way). Notice I didn’t add any strips on the drawer fronts because the curvy details on the edges already looked good. And the paint alone gave them a more modern look. Let’s not forget the hinges! My budget was so beyond tight that I even decided to save the hinges. First, because the holes were already there. Second, they were in pretty good shape (these were not from the 60’s, I don’t think). And third, I already had silver spray paint from another project and didn’t fell like going to the store to buy new ones. 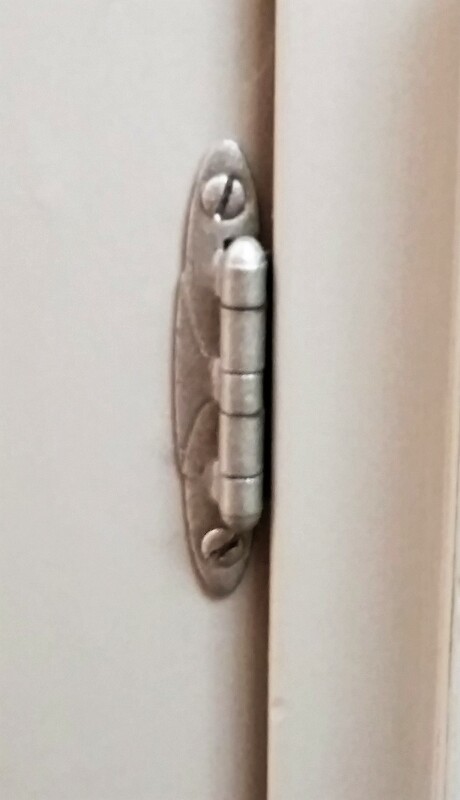 These hinges are not really that expensive (about $3 bucks each). I was just really penny pinching here. After putting the vanity together and putting it back in the bathroom, it was time to install the new butcher block counter top. To cut the butcher block, I used the old countertop as a template for the new one. But I didn’t want that ridiculous angled cut in the corner like the old countertop so I decided to make it a straight cut instead. If you are tackling cutting the butcher block with a circular saw and you never did that try recruiting someone who knows how to do this. Maybe the “hubs” or a neighbor. Unless you are crazy like me and will try anything. Then just watch your fingers! After making all the cuts including the opening for the sink, it was time to seal the countertop with polyurethane waterproof sealant. 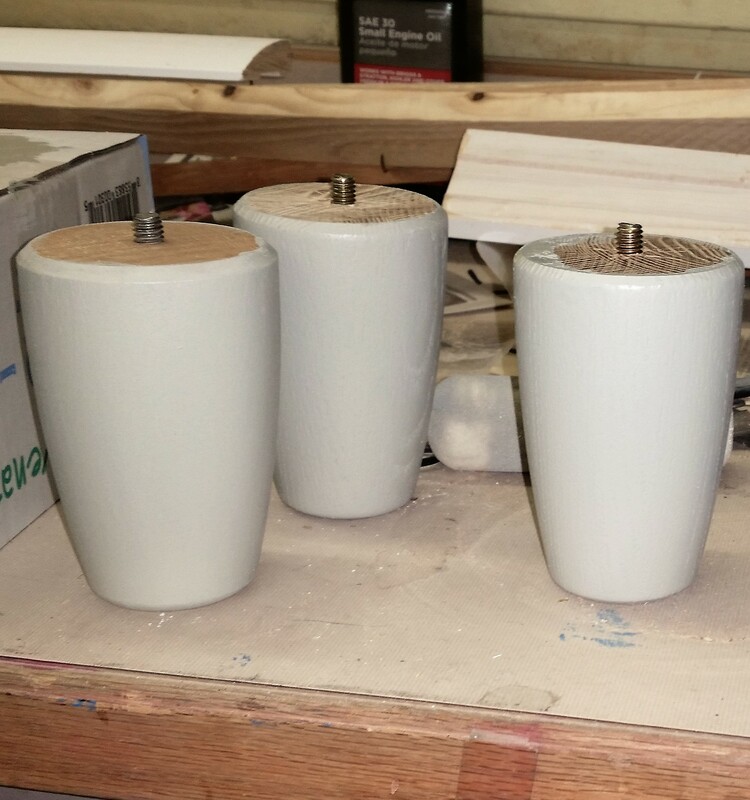 Be sure to sand between coats and follow the instructions on the can. It’s not a difficult job but it’s messy. And for someone impatient like me, it was tough to wait 2 hours in between coats. I did about 5 of them. After the countertop was done, installing it was a breeze. 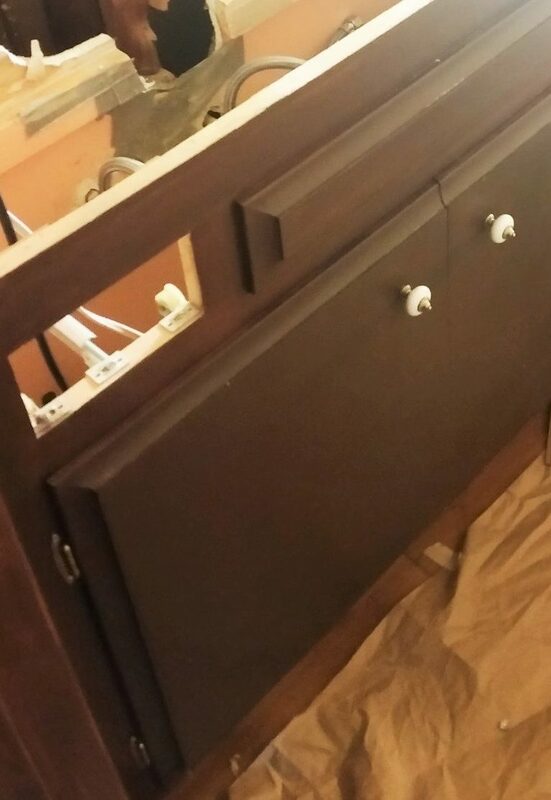 I just needed “L” brackets to hold it in place with some short screws (make sure they are not longer than the thickness of the countertop or the vanity frame. Because I was using the same vanity as before, the pipes were pretty much there. Except, I wanted new pipes because they were pretty gross (who knows how old these were?). If you DIY the plumbing, be sure to watch plenty of videos if you never did this. It’s not hard, but it’s a frustrating job. Be sure to check for leaks so you don’t have any surprises like mold or ruining the wood under the sink. After it was all in place I installed the sink (pretty easy to do) and sealed the edges with clear silicone. Be sure to use blue tape on the counter around the sink and on the edges of the sink to avoid getting silicone everywhere. Oh, and wear gloves! What a mess! Wipe the excess silicon and pull the tape and voila! A clean “caulking” job. After the plumbing work was done it was pretty much just installing the new drawer and door pulls and the hinges. 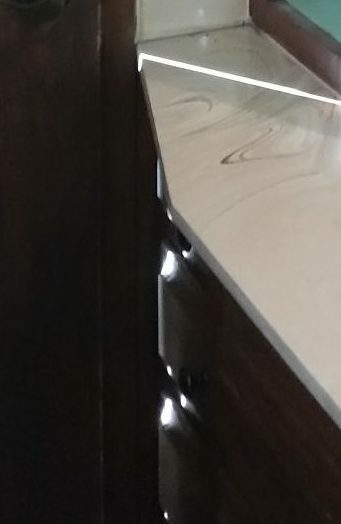 I found these modern looking pulls on Amazon and they gave a very fresh and modern look to the vanity. The vanity looks completely new and fresh. It doesn’t even look like the old sad vanity. The total tally on this project? $195.28. $19.84 for the door pulls and knobs from Amazon. I already had the sealant, silicon calk, liquid nails, tape, rollers and brushes at home but if you were to buy it all it would be less than $40 bucks for all of them. Not bad for less than $200 bucks with the counter top and sink and pretty much custom! 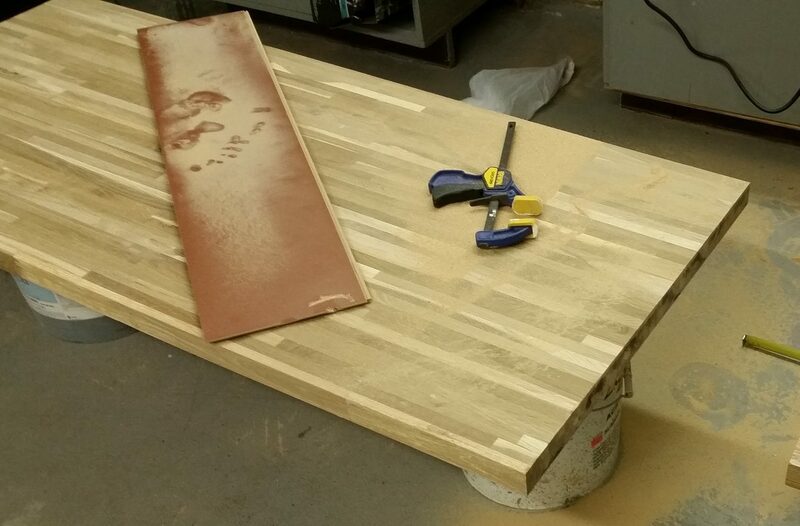 Another way to do the counter top, if you think the cost for the butcher block is too steep, is to buy 2×6 or 2×8 lumber and make your own butcher block. 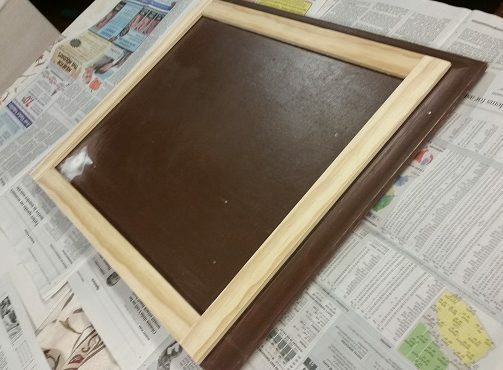 You can glue the boards side by side with wood glue. Then let them dry overnight with clamps holding them together to ensure that there won’t be any gaps between boards. Seal it with polyurethane and voila! DIY butcher block for less than $20 bucks! I had fun doing this project and seeing how it turned out. I know some may think $200 is a bit much for a vanity redo. Especially, when you can buy a new one for around $300. But you won’t buy quality for that price. Plus it will never have the “personality” of a butcher block finish. Nor will the quality of the wood construction be the same. I can probably get another 40 years out this vanity (maybe with a new color trend when the gray gets old). 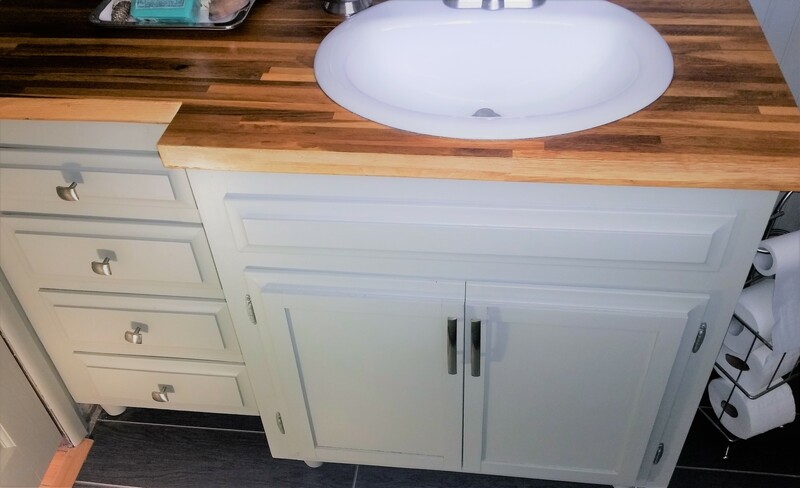 If you have a decent countertop but only the vanity needs a fresh look, you may only have to spend money on paint, replacement pulls or minor finishes. You could probably do that for less than $100 (that’s counting buying a faucet that’s over $30 bucks). I hope this project has inspired you. Try using things you already have at home. Make something new out of them. If the piece has “good bones”, why not use it? Please share your before and after pictures and stay tuned for more projects. I hope you enjoyed this project. Follow us on Facebook and Pinterest for new updates and cool projects. And don’t forget to sign up for our email list below to receive news and updates.